Because Kingdom wants to be more than just a place for you to get media and duplication supplies, we would like to share with you the moving history of how Kingdom came to be! Just a few years ago, an important era at Kingdom came to an end. Al-Marah Majestic Sheik, the world famous Arabian trick horse trained and owned by Kingdom President Johnny Berguson, died in the Intensive Care Unit at Cornell University’s Equine Hospital. Sheik was 22 years old. Known as "Johnny and the Sheik," the pair traveled across the U.S. and Canada, performing at exhibitions, horse shows, rodeos, and fairs. They also tackled movie stunts, appeared on many television shows, and were the subject of countless articles in magazines such as Horse & Rider, Arabian Horse Journal, Nashville Magazine, and Christian Life. Johnny estimates that Sheik made over one thousand personal appearances during his lifetime. A day's work would find them addressing a Sunday School class, or a world satellite audience of millions. But everywhere Johnny and the Sheik went, they took the opportunity to present Johnny's Christian testimony and a Gospel message. Sheik was also a popular guest on "The 700 Club," appearing four different times. According to the show's staff, one of those segments was among their best ever, and was rebroadcast on "Best of the 700 Club." Other TV appearances included several episodes on other national TV programs, as well as a special program with Pat Boone. "Sheik did everything any other horse would do," recalls Johnny, "but completely without aid of a bridle or headgear." Their performances often displayed the trust between them, featuring Johnny riding Sheik with his then 21-month old daughter Rachael, or later with his 3-year old son Jonathan standing on his shoulders while Johnny rode Sheik at a gallop! "Suddenly, in just one week's time," Johnny explains, "our entire itinerary collapsed. And our schedule for the rest of the year was empty. My wife and I were devastated and confused." For all their praying, Johnny could only think of the Scripture, "If any one will not work, neither shall he eat." (2 Thess. 3:10) So out he went, every day, looking for work, but nothing came. Then another Scripture, "In all labor there is profit," (Prov. 14:23) gave him an idea. "In training Sheik," Johnny went on, "I had applied Biblical principles for raising children, and it worked! So I decided I would record and distribute audio cassettes on horse training." He wasted no time getting started. The Bergusons borrowed five hundred dollars and created a 14-cassette series with Johnny's horse training lessons. His testimony and Gospel message were still included, this time on a free cassette. While the "horse course" began selling well, Johnny often sold extra blank tapes at a discount to local churches to save them money. Soon, those churches needed tapes more regularly. Then they needed equipment and other supplies. And in the basement of a simple ranch home in rural Pennsylvania, Kingdom was born! That was over twenty five years ago. Today, Kingdom is one of the largest suppliers of blank audio cassettes, digital media, and electronic equipment in the country. "We all owe our jobs to God first," says Johnny. "But also to Sheik. We got our start with those horse training tapes - and that course is still available!" In June of 1996, Sheik went to Cornell for knee surgery, and had trouble coming out of anesthesia. "Even though he was in a padded recovery stall," remembers Johnny, "he fell and broke his shoulder. It was a fluke. His vets told me they only see a thing like that once or twice in a decade." 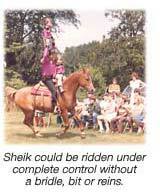 In fact, the Cornell team felt sure they could save Sheik, until he fell a second time, breaking a hind leg. 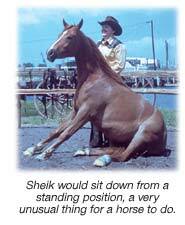 Sheik was named after Handrick's Sheik, Johnny's first bridleless trick horse. 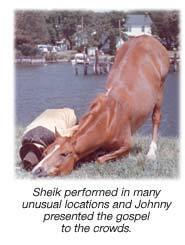 Johnny was just 13 years old when he trained Handrick's Sheik. Al-Marah Majestic Sheik was buried next to Handrick's Sheik on the farm owned by Johnny's father in nearby Covington, PA. "I traveled with Sheik for over a dozen years," Johnny said, "and I took care of him every day for over twenty years. Not a day will go by for a long time to come that I won't miss him. He was my friend."